There is something oddly unique about this composition. 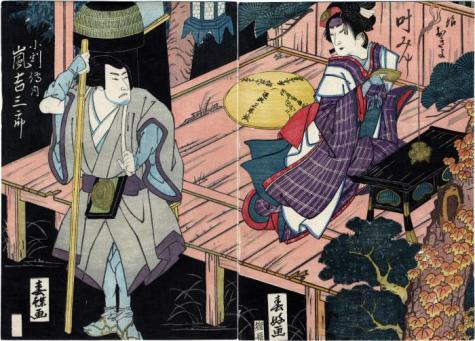 Not only is it a collaboration between two significant artists, something which had been done before, but the layout and the dramatic use of black contrasted with the pink of the engawa and the bright yellow of the onnagata's sedge hat seem to set it apart from other prints from this time. Another point of interest is that the printer's seal does not appear in the oblong box reserved for it on the left panel. Of course, this is not unheard of, but still it is unusual for such an unusual composition. 1) Ikeda Bunko, Kamigata yakusha-e shūsei (Collected Kamigata Actor Prints) Volume 1, Ikeda Bunko Library, Osaka 1997, no. 51. 2) Schätze der Kamigata: Japanische Farbholzschnitte aus Osaka 1780-1880, MNHA (Musée national d'histoire et d'art Luxembourg), p. 186, #390. 4) Kabuki Heroes of the Osaka Stage 1780-1830, British Museum, 2005. This diptych is an example of gassaku (合作) or where more than one artist contributed to a composition. In this case it was separate sheets, but in other cases one artist might provide the figures and the other the background or some other motif element.